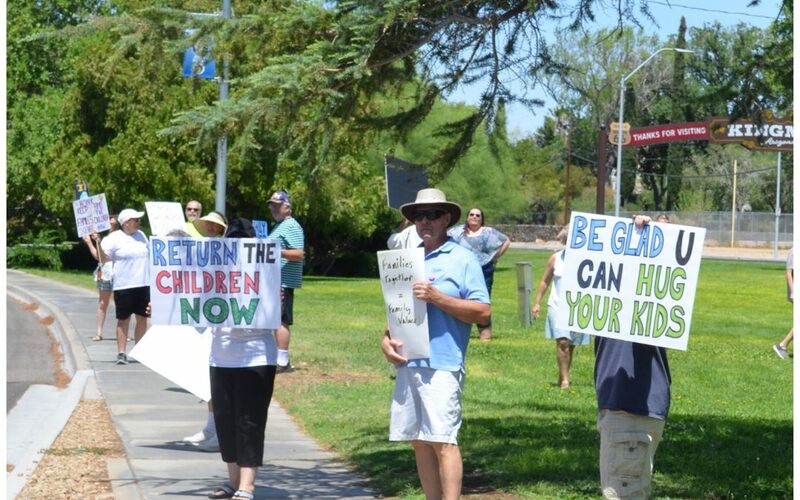 KINGMAN – It’s been a busy year for political activism in Kingman and Saturday’s ‘Families Belong Together’ rally has now been added to that list. Nearly 60 people of different ethnicities, political affiliations and religious affiliations made their way to Trinity Episcopal Church on Spring Street—and later to Locomotive Park—to bring a sense of rationality and compassion to the recent immigration situation regarding the treatment of families living illegally in the U.S. or crossing the U.S./Mexico border. The Kingman rally was part of many nationwide bringing light to children being separated, some reportedly forcefully, from their parents by U.S. Immigration and Customs Enforcement and Border Patrol agents. “The main goal of these rallies is to reunite families now,” said event organizer Sharon Weber during a short service promoting information and testimony at Trinity Episcopal. She was among many who spoke out against past and present policies, more recently by the Trump Administration, allowing the separation of children from their immigrant parents, many who are fleeing poverty, violence and civil unrest. She’s well aware of the opposition to social justice issues in the mostly pro-Republican Mohave County. She’s participated in the March for Our Lives and Red for Ed Arizona Teachers United rallies early this year. Poems were read and emotional testimony given during non-denominational and non-partisan church service, which was the air-conditioned precursor to the park event. “This Episcopal church believes in social justice,” said Father Phil Shaw. Mary McCord Robinson, another vocal community activist and Democratic candidate for Legislative District 4, talked about her late father, a retired U.S. Border Patrol Chief. At 11 a.m., most of those at the church swapped air conditioning and speeches for sun, signs and drums at a more visible location at Locomotive Park across from the Kingman Powerhouse and Visitor Center, the same location for the last major political rallies. The high-traffic volume of curious tourists and passing motorists gave mostly positive response to the group’s message in the form of selfies, honks and cheers. As opposed to the March 24 ‘March for our Lives’ rally that drew profanities and near-fisticuffs, only a few middle fingers, calls to build a wall and a “Go back to Mexico” shout-out punctuated the otherwise peaceful demonstration. Regardless of how those in the mixed group felt about illegal immigration, they all agreed that taking kids from their parents is a bad idea. Political activism is relatively new to Kingman resident Elle Bentley. After raising five children, running a day care, surviving cancer and dealing with the death of her husband three years ago, she decided to start reading more, questioning more and finally mobilizing. This was her first protest, and it’s the treatment of children that rang the bell. “This was the straw that broke the camel’s back,” she said. Raised in a conservative Republican family in the mostly-conservative State of Texas, Bentley was frustrated with other hardline stances conservative leaders have taken on other social justice issues. She won’t be silent any longer and encourages others to do the same. For information on Saturday’s nationwide rallies, go to www.familiesbelongtogether.org and www.moveon.org.